This Star and Tribune editorial comes pretty close to reflecting my view on what may have been one of the more disconcerting and disturbing votes I took in 2017 as a Minneapolis City Council Member. Moving forward I will be proposing and pushing for a new ordinance that will require future Council and Mayoral salary increases to go through a formal and public committee process. This will likely include the establishment of an appointed commission, similar to that set up for the state legislature, to make recommendations. For now, though, I would like to share some of my thoughts about the Mayor and Council Member salary vote taken this December. First let me say that I have always felt that my compensation for working as a Council Member has been fair and generous. I am grateful for the opportunity to do this work and have always felt that I was, and am, well compensated for it. The increase that was approved this year was not my idea or my initiative. This came from Council President Johnson and I do not think this was not done well at all. It did not follow a healthy, open or transparent process. Generally, I do not like having to vote on my own salary as an elected official, or the salaries of my elected colleagues, but understand that there may be no better alternative. It seems awkward and difficult because there is an inherit conflict of interest in such a decision. Still it is one that I have been willing to make and I have been comfortable with making based on the formula developed by a previous council and used to set the salaries for the Mayor and Council Members during the previous terms I have served. This year, I knew that we would have to do something before the end of 2017 because it is required by the state law that authorizes the Minneapolis City Council to set the annual salary of the Mayor and each Council Member prior to the terms to which they have been elected. When a salary resolution didn’t come up through the Ways and Means committee, as had occurred in 2005 and 2009, I was expecting to see it as New Business at the last Council meeting of the term as I had in 2013. In all three of those years the salary increase was based on the average of recently approved labor agreements. I was expecting and counting on the Chair of Ways and Means or the Council President to be taking the lead on this, as they had through my first terms. On December 14, 2009 it was considered at the Ways and Means committee and then amended and approved by the Council on the 19th and said basically the same thing and also approved a $400 a month car allowance. In 2005 the Ways and Means Committee had it on their December 19th agenda and recommended a 2% raise for 2 years and then an average based on all labor contracts. This, along with a car allowance was approved by the Council on December 23rd. I was expecting something similar to be presented to me and my colleagues to be voted on at the last Council Meeting of the term on December 15. I first learned about this year’s different proposal was on December 14th when I returned a call from Council President Johnson who then informed me that she planned to add a resolution to the agenda that would increase the salaries of the Mayor and Council by $10,000 in a one-time adjustment for 2018 and then inflation based on average annual collective bargaining agreements for the rest of the term. Since then, I did recall that this fall, she had mentioned at one committee meeting that she was concerned that Council salaries were not keeping pace with the rising salaries of other city employees and she was interested in looking into that. Since that time there had been an election, Barb was not reelected and I had heard nothing of the idea since, so I assumed she was not planning on bringing anything out-of-the-ordinary up. During the phone call, she explained a little of the rationale for the increase and then answered by question about support telling me she was sure she had the votes to pass it. Because a sitting Council cannot change its members’ salaries and no one else has the authority to set the Mayor’s or Council’s salaries, a postponement in order to get more input seemed impossible. There were no more committee meetings scheduled and getting support for an additional special meeting was clearly very very unlikely. I was convinced (and remain so) that the decision to increase our salaries like this could and should have been part of a committee discussion and our budget approval process. Now I felt cornered and conflicted. My options were to vote no, abstain, or vote yes. I felt if I voted no and then kept the increase it would be hypocritical. If it passed and was deemed to be justified (which I was assured it would be,) not taking it also seemed unfair to my family and myself. I listened to Barb’s rationale and I ended up voting yes but I still have mixed feelings about my vote. One of the things that seemed to be motivating Barb the most was the noticeable gap in salaries forming between some other mid to high level "managerial" staff positions and the Council salaries. In the City we grade jobs based on responsibilities and other factors. Our professional Human Resources staff had determined that a grade of 10 -12 seems close to the work of the Council and that the Council’s compensation had fallen behind a comparable group of managers, union and appointed (grades 10 to 12) in the City. In 2017, the Council members’ salary is $88,695. 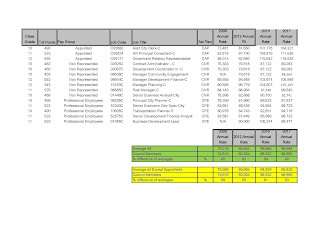 A comparable City of Minneapolis management group is over $98,000. Ten years ago, the Council and the comparable group were both at approximately $74,000. To better understand this staff looked within the City organization itself to identify non-elected official jobs where functions, duties or responsibilities’ overlap with the work of the elected officials. Because the Council Member job is not exactly like any other single job they developed a “basket” of jobs comprised of many jobs that together they felt reflected the type of work that a Council Member does. This comparison looks at internal equity within the organization. Through this analysis, they created a basket of senior professional jobs with some of the supervisory and managerial functions that council member work requires. The average compensation rate for this basket of jobs in 2017 was $98,994. When they looked at a longitudinal study of how Council Member compensation compares to this same “basket” of jobs over time, the internal equity relationship showed change. Below is the summary data. Also, more details below. Human Resources staff also did a market comparison by looking at how other similar businesses/jurisdictions compensate similar jobs. 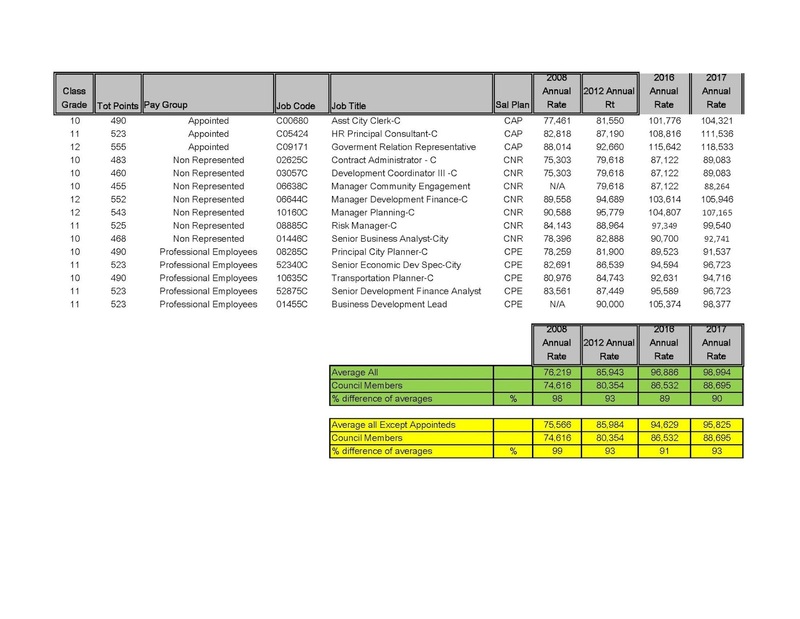 Understandably, Council Member jobs are difficult to measure in the broader market. The roles and responsibilities assigned Council Members including full-time/part-time expectations, and local-political philosophies about to what extent the elected officials are compensated commensurate to the work performed in non-elected jobs that require similar knowledge sets, like tasks, duties and responsibilities, etc., complicate comparisons. Still, our staff identified a sample of cities that had full-time city councils, and found that in 2017 we were below the average of those by approximately $3,000, with the range being $60,000 - $120,000. Generally, this increase puts the Council on par with other full-time Councils in Denver and Boston and will still be approximately $20,000 less than Portland and Seattle. In St. Paul, a “part-time” Council member is paid approximately $63,000 in 2017. The increase to the Mayors salary from $116,528 to $126,526 will match the City of St. Paul Mayor’s salary for 2017 of $126,000. With this rationale, in the time frame I had, I ended up voting with my colleagues in support of this. It was a close call for me. It is not a close call for me, however, to be determined to make sure this poor process is not repeated in the future. So, in the weeks ahead I will be working with Council Member Andrew Johnson, City staff and others to draft and approve an ordinance that will outline a more transparent, public and consistent process for future City Councils to use and make sure that this kind of last minute and closed process is never used again to determine the salaries of elected officials in Minneapolis City government.